It’s hard to describe business owner Dalton Leonard, self-proclaimed “born entrepreneur” and the 24-year-old founder of FantaSea Aquariums, a company that specializes in aquarium maintenance, design, and installation. To say he is a role model doesn’t quite do it. Charismatic? Passionate? Visionary? Destined for greatness? All of the above. Just the kind of employer Way2Work wants as a mentor for students transitioning to careers after high school. Now, put Dalton together with Amanda Tosoni, Career Resource Specialist with Work Opportunities Unlimited, and unleash the pair on Chris J., a junior at Southern High School in Anne Arundel County. What you get is a work-based learning experience like no other. It’s so targeted, so personalized, so. . . perfect, that it’s hard to imagine a better fit. Chris knew he wanted to share his love of animals with others, especially younger kids. He thought he wanted to work in a zoo, according to his mom, Meleisa Jones. But then Way2Work came along, with a job specialist like Amanda. She heard about Dalton and his work with Anne Arundel County Schools setting up a Science Center in Southern High. The Science Center will be a field trip destination for the County’s grade school kids, according to Eric Day, STEM Elementary Teacher Specialist. And, it’s right in Chris’ own high school. Rose has always loved animals. Dogs, cats, horses, sheep—she loves them all. So, when she met her employment specialist, Walter Graden from Humanim, there was no question about what field to place her in. He connected her with a volunteer job at Chesapeake Therapeutic Riding School in Street, Md. Even though Rose had never worked in a stable, she quickly became one of the school’s top volunteers. “She comes in and gets right to work,” says Kathleen Schmitt, executive director and founder of CTR. “She always has a smile on her face.” Rose has achieved proficiency in grooming and feeding the horses, mucking stalls, and performing general barn duties. She also does “walk alongs” with the assistance of a staff person, when students at the school are riding. Tim has always wanted to work at or own a shoe store, so his employment specialist, Megan O’Neill of STEP, thought the small business on Main Street might be a good fit. She was right. 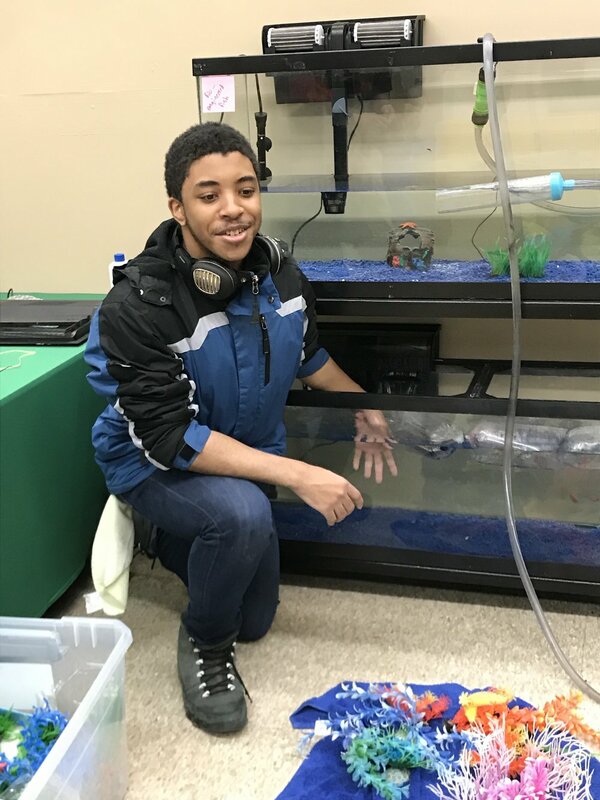 The experience he has gained at Avenue is pointing him toward college and a degree in business. Working 2-3 hours a day, five days a week, Tim drives the company vehicle and picks up and delivers dry cleaning in four locations around Carroll County. In his new job, he will learn how to work the front counter, interact with customers, and gain an insider’s view of the operation. Karli dreamed of finding a job that would combine her three loves: photography, art, and design. Her first work-based learning experience was heavy on the art, but light on photography and design. Her new job, at Silver Linings Lavender, that she got through Way2Work, has everything she was looking for. But it took a little extra effort to find it. Karli’s first day on the job was the day of the Pride Parade in Westminster, one of the busiest retail days of the year. Traffic in the small boutique on Main Street was non-stop all day. “There was a line out the door. Products were flying off the shelf,” says Dawn Pritchard, Silver Linings Lavender’s owner. Having Karli’s help that day was really important; she re-stocked the shelves as quickly as they became empty. “I can’t sell product if it’s not on the shelf,” says Dawn. “That day, I didn’t lose any money.” However, Karli is a shy person. Interacting with customers isn’t her favorite thing. According to Dawn, “To be in retail, you really have to be an extrovert.” After that first day, Karli thought, “I wouldn’t want to do this for a living.” But here’s the silver lining. Dawn opened Silver Linings Lavender in 2013 as an online store. It wasn’t until September 2017 that she expanded into a brick and mortar store. The majority of her business is still online. And that’s where Karli shines. By day, Coardell is pursuing a trade in welding at Worcester Tech. He doesn’t love welding, but it’s better than any of the jobs he’s had at MacDonalds or WalMart, or washing dishes at a restaurant in Ocean City. Outside of school, though, Coardell has other passions. He amazes audiences with his dance moves. He has performed in venues all over the Eastern Shore as well as in New York, and he dreams of making a living as a dancer and rapper one day. Someone with the soul of a dancer might feel restricted and confined in the tight quarters of a welding booth. And the protective gear that welders wear—including a heavy mask—might make it hard for a dancer to move his feet. So, Way2Work helped Coardell get a job at Go Glass, a shop that specializes in residential, commercial and auto glass. Here, Coardell has room to bust a move now and then. “I finally found something I enjoy doing,” he says. THE MARYLAND WORK-BASED LEARNING COLLABORATIVE IS FUNDED THROUGH A COOPERATIVE AGREEMENT WITH THE MARYLAND DIVISION OF REHABILITATION SERVICES (DORS) FROM THE U.S. DEPARTMENT OF EDUCATION, REHABILTIATION SERVICES ADMINISTRATION (RSA), GRANT H4213160006. THE CONTENTS OF THIS WEBSITE DO NOT NECESSARILY REPRESENT THE POLICY OF THE U.S. DEPARTMENT OF EDUCATION, AND YOU SHOULD NOT ASSUME ENDORSEMENT BY THE FEDERAL GOVERNMENT. The Vocational Rehabilitation program receives 100% of its funding through a grant from the U.S. Department of Education for this project. For Federal fiscal years FY 17 to FY 21, the total amount of grant funds awarded were $7,519,895.